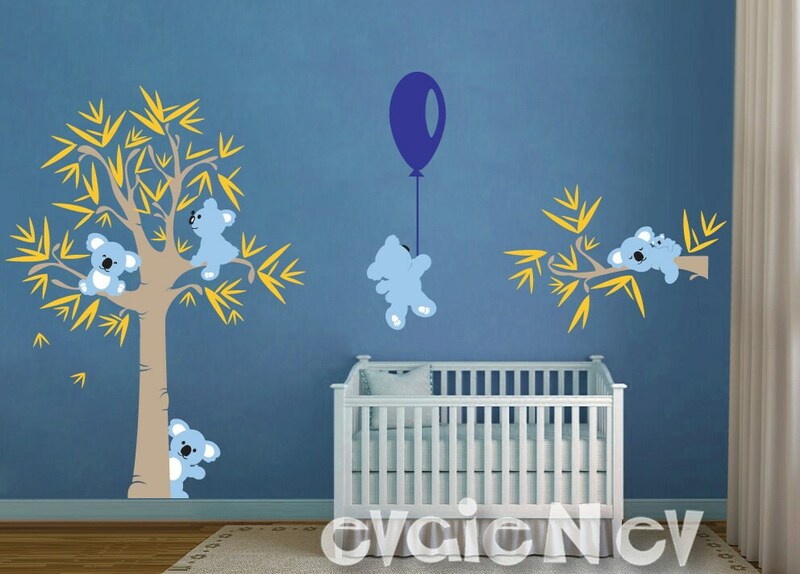 Inspired by Winnie-the-Pooh this decal set features five cute koala bears plus a baby koala sitting on the tree, flying on balloon and sleeping on the branch. Removable Sticker is made using Top-Quality Matte Vinyl. Perfect to decorate and add your personal touch to any space, switch themes in child's room. Just peel and stick, it's so easy! Included FREE test decal. I love this wall decal; however was disappointed with long the shop took to ship it. I ordered this on December. 4, 2018, thinking it would be enough time to have it delivered so I could decorate baby's room before my due date of December 28th. A week or so after ordering and seeing that it wasn't shipped yet, I email the shop and never heard back! The item was finally shipped on December 20th, and I received it late on December 26; So instead of spending a relaxing day before my baby was born, my husband and I were spending the day putting the decals up! Like I stated, I loved the decals and they look great in baby's room, but the delay shipping with no communication make me very hesitant to buy from this shop again.